There was no doubt in my mind that the first-person shooter based on AMC's The Walking Dead television series would generate some truly horrific swag. I just didn't think it would show up so soon. Activision gives fans four earfuls at San Diego Comic-Con this week. A necklace of ears was not on my Comic-Con wish list, yet here we are. 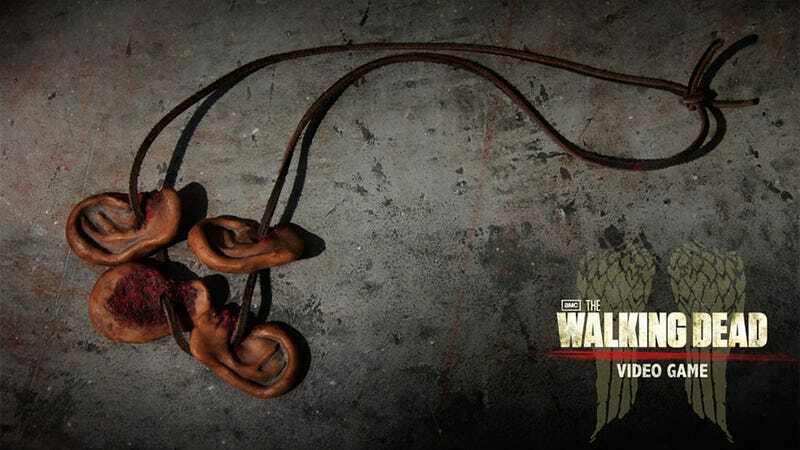 The first 100 fans to preorder The Walking Dead first-person shooter at Activision's San Diego Comic-Con booth (#5344) will score an extremely limited edition version of Walker's ear necklace from the hit show. You won't be able to secure one of these anywhere else, though you might be able to convince someone to make one for you on Etsy. Hey, at least it's not as nauseated as Telltale's E3 swag. Evan and I will be at Comic-Con come Wednesday. If he comes near me with one of these I'm going to punch him right in the face.